I processed the feeds in my feedreader and aggregated the most important ones in a short video. In Domino you have multiple options how to provide a search function for an application. I have seen many examples where a FT search query is build for a database, where the form type is defined, which fields should be used in the search etcetera. Most of them are a maintenaince nightmare, layout is little flexible and usability is lacking (e.g. perform a search towards a query which will result in zero hits). What if you make it easier to maintain, more flexible for user specific desires and add facetted search principles? A win situation? In the following posts I will write how to use the jQuery DataTables plugin to provide a quick search function for your Domino apps. I assume you use XPages. a Notes view to use as data source. In order to create some fake documents I have set up an LS agent to do so. A while ago I wrote about how you could build a Live Search function with Domino Access Services & jQuery Tokeninput. Since then the current version of that has been improved on several items, perhaps I will write about it in another post. The term did not cause a failure when performing a search in the Notes view in the Notes client, but on the web in Java the FTSearch method on the NotesView object failed. When checking the data in the view and document the value was exactly as in the text above there. The full text search treats most symbol characters as a white space. The exception is if the search term itself is wrapped in quotes. So it turns out the comma is translated into a white space and that results in zero corresponding documents in my FTSearch! Hopefully some is out here aware which characters are on that symbol character list so I can adapt my livesearch function ??? In a previous post I demonstrated how to use Domino Data Service (as part of Domino Access Service) to populate a listview for jQuery Mobile. Probably the real-world application you want to mobilize has multiple layers of data that is common in Notes (multiple forms & views). I followed Christophe Coenraets’s example and re-used it for the fakenames application. 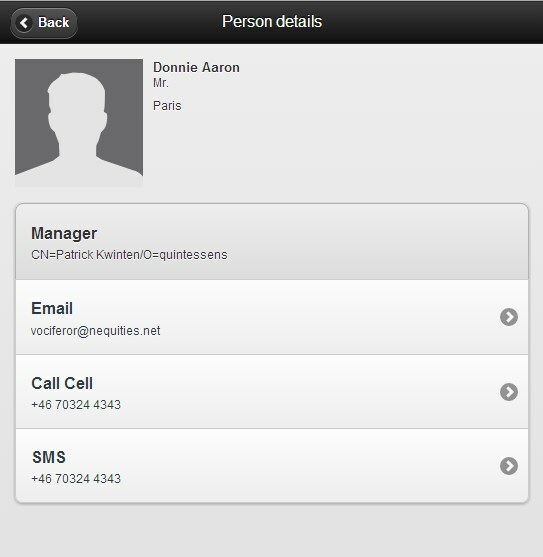 At first an overview of the People’s view is presented, from here the user can open the Person details page. In Christophe’s example you can find a more nested navigation but our fakenames application is not setup like that. 2 XPages; eg people.xsp and person.xsp. Your modified version of employeelist.js and employeedetails.js in the download from Christophe page. The CSS files in the download from Christophe page. The jQuery JS files in the download from Christophe page. For convenience I have dropped the files from the download via the Package Explorer in the WebContent folder of the fakenames application. In case you want to mobilize your fakenames application a step further e.g. by packaging it via PhoneGap to access device native api’s you don’t want to store these files here and you don’t want to use XPages to render the HTML. Of course we assume you have Domino Access Service enabled for the Domino server and the fakenames application. These files do not differ from the index.html and employeedetails.html files in the download from Christophe page. In case you use XPages you should consider to turn of Dojo and Themes. At the page initiation the function getEmployeeList is called. This makes an Ajax request to the REST API of Domino Data Service and a document collection with the first 1000 entries (if available) in the view named People is being called. I have not taken a look yet how to implement lazy loading or appending additional document collection(s) when scrolling. If you happen to know how to implement such function please drop me a line here or send me an email. Then list items in the employee ID element on the Xpage people.xsp are removed (when available) and we loop through the results returned by Domino. We create a new list and establish a hyperlink to people.xsp and add the UNID of the document as parameter. 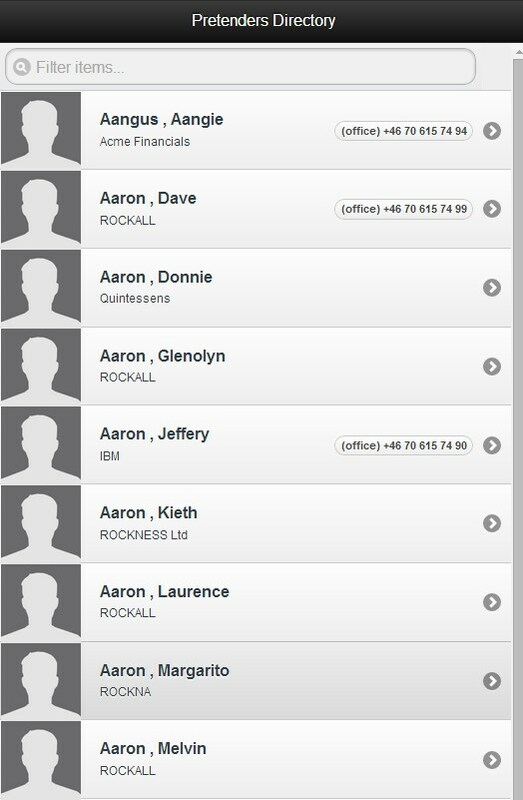 At last the result is appended to the (emptied) employee ID element and the listview is being refreshed. Wow! You got now a nice list of persons in the directory. The idea behind the details page is similar to the people’s list, except we have now a single object in the JSON. First the ID provided by the parameter is abstracted from the URL and used in the call to a document source via the Domino Data Service. From the result a set of details is abstracted and presented to the user. Some HTML5 attributes are used to deliver a more native behavior when clicking anchor links (telephone, mail, SMS). jQuery Mobile and Domino Access Service provide good foundations for creating mobile Web apps on Domino. However I am a bit thoughtful on the speed of Domino Access Service. If you happen to know how to speed up performance for this please drop a line here. In a next post I will write the implementation of CRUD actions with jQuery and DDS. Admin question: Does $$ReturnAuthorizationFailure works with session based authentication? I tried to implement a custom web authentication error page on application level based on these guidelines: link. Unfortunately, the custom $$ReturnAuthorizationFailure form never appears when accessing a document I did not have access to. Instead the default error page is being displayed. One answer says Yes, the other says No. Which one is correct? 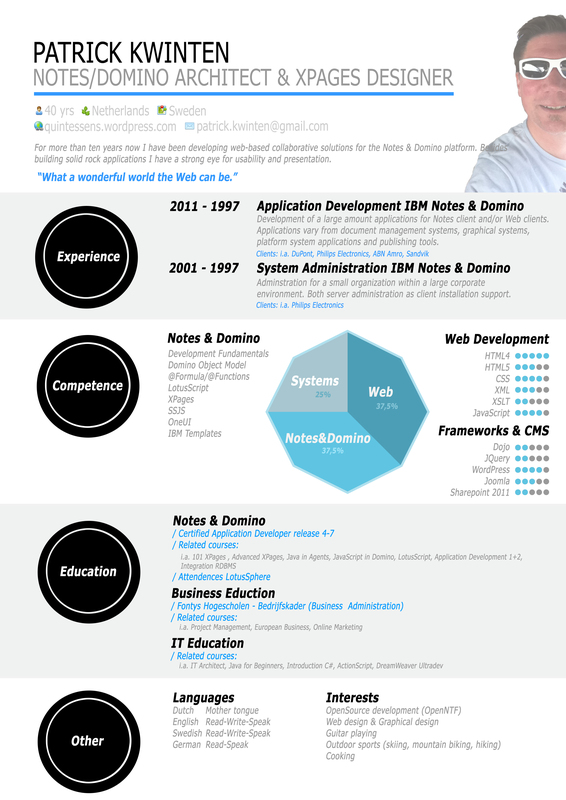 I do not know about the existens of the SwedishJob.com site but here you can find the advertisement for a System Developer in Lotus Notes and Domino. Sounds exciting? Then head on to the Sandvik career site. I saw this function is now posted on Computer Sweden: link and on the Sandvik careers site. Today we discussed to provide a checklist for developers that can help them with auditing the security of their applications. Overview Introduction Controlling Access to Notes/Domino Data Tools The Access Control List Setting Up and Refining the ACL Access to Database Elements Participants Partners in Securing an Application Web Users Anonymous Users Case Studies Problems … 28 Apr 2005. However the link is dead. Does anyone know if this tutorial is available under a different address?